But here is the quick and easy solution to how to fix Google Plus: Put RSS Back In Our Google+ Stream! We have all heard the “Search Without Search” Google is coming. OK, where is it? 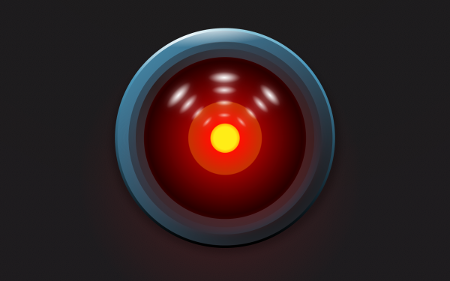 We have heard the claims of artificial intelligence for years now. How Google can or will soon algorithmically display great new content for us to discover. We all heard how filtering our social feeds help remove the noise, mostly from Robert Scoble and Facebook. Well let me be the first to say “The Machines” are not doing their jobs. Not for me, at least. And that means it’s time to go back to the old way of doing things. It’s time to put what we see in our social feeds back in our hands. Not in the hands of who we follow and not in the hands of the algorithms that filter what our friends share. After 7 Years Of Being “Social” It Has Failed Me! Ever hear how content is king! Well those days are over. We have turned into an incestuous “Good old boys club” that share to get re-shared and hawk silly gifs, Meems and content not because it is awesome news– But instead our sharing is comprised of content that is shared only because it will get re-shared and get traction. Social overall has become irrelevant for me and my niche is simply not here on G+. By allowing me to add RSS feeds to G+? Well that could make it work for me again. “If all you have is a hammer, every thing looks like a nail. Bottom line, search is great for answering questions. But what do we do when we find a great blog? The days of Google+ badges and Like us on Facebook widgets are gone. I even finally took all of my Google+ sidebar badges down. Fork em! They are dead. Depending on a blog to have a G+ presence for me to be able to see their content here is simply and utterly egotistical. Same for the filtering on Facebook. Right now, the glory wild-wild-west days of social and before that RSS is over. And I want it back! Or on the odd chance the blog has an email list newsletter form? Well my Gmail is a great testament to what happens when you follow every great blog via email. 300 emails a day, every one worth opening and every email with great content, video or a podcast recording inside. Every one unread, unopened and in 10 years? 63 Gigs of stored emails. What About Feedly, Can’t We Just Read Blogs There? Yes, I want outside content. Isn’t that what following people on social is about? Them sharing outside content for me to discover? Or that I may have otherwise not seen? And no one wants to read blogs on Feedly. Because you and I have all become conditioned to getting something back from social. We judge our time spent on any site by who follows us, how many followers we have and and +1s / Likes in what ever form they come in. Why Does Google+ Get Called A Ghost Town? When someone like me with 50,000 followers shares a blog post they spent hour(s) writing and you get zero interaction on it? Well that is where “G+ is a ghost town posts” come from. My own ego tells me you want to read my writing, and that leads us all to believe no one ever saw it on Google+ or Facebook. Giving us the power -Bradley Horowitz- to see what we want to see, outside of who we follow. That would be a great way to revive positivity about what ever is to become of Google+. RSS is still available on every blog. Why not just give us the option to use it? We need to be in control of what we read and see, not at the behest of the bloggers sharing, not at the filtering of an algorithm, and not having to use 4 different platforms to stay abreast of what is going on. And not having to follow people, and endure their cat pictures. You should see what they say about G+ on Facebook the last few days. If anything the press G+ has received lately is yet another decline in quality content being shared here. Confidence outside of Google+ itself is at an all time low. The idea that every blog on the Internet is going to share content into G+ is utterly heretical on Google’s part. And the idea that I have to pay for my content to be seen of Facebook is just plain greedy too. Outside what I have seen Ana Hoffman post lately, there is simply nothing here for me when it comes to my business. From a publisher’s standpoint, same thing. No one in my niche is here on G+. They all left and went back to Facebook. As Google originally envisioned, social should be a layer within content, not the entire burrito as it has it is in 2015. Don’t want a RSS feed of blogs in your Google+ feed? Well then don’t add them. Or we should have the option to not display them. Google; are you listening? Now if Google gave us back the “Add to Google” button like we had for Google Reader in 2008? Well, then they would be providing the service to publishers that we need to make time spent here worthwhile. And Google could certainly one up Facebook that no longer wants to display our content unless you pay for that appearance. And I think you will all agree the Internet could use a great free traffic source back in the hands of the writers who write- and the readers who read! Before you do anything: Take a good look at your home feed before doing anything. Take note of what appears there and what does not. Now below tell me in Google+ comments what you think about this below… You are more than welcome to link to your own posts and screenshots. I value your feedback! DISCLAIMER: In no way am I saying G+ is heavily filtering your feed like Facebook is. What I am saying, is that I found tons of people, using this hack, that I had not seen in a long, long time. And we are not talking small users, we are talking some of the biggest users on G+, both people and pages. The most notable Mashable and it’s founder, Pete Cashmore. I denoted more on the embedded post above late yesterday evening, to see them, click the post and expand comments there. Bottom line is this: Play with this thing, find out for yourself and make up your own mind. My viewpoint is that this may well prove my point that I believe there is a very sharp Google interest graph algo at work on Google+, and has been for a long time. Prove what ever you can for yourself, I found this exercise very interesting yesterday! UPDATE: Here is why your Google+ home feed is broken and highly filtered. 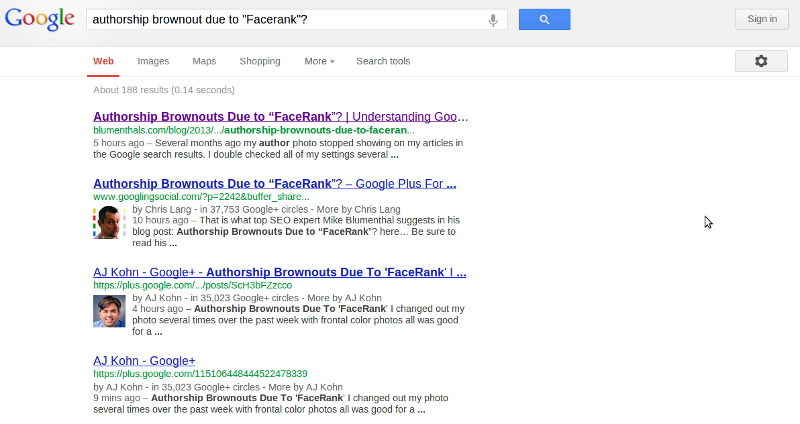 Don’t believe what you hear about toolbar PR, or as the less informed like to call them: PageRank updates. We hear this every few months, each quarter when Google Toolbar PageRank numbers change. Toolbar PR Is A TOY: –nothing more, nothing less– It has nothing to do with real PageRank algorithms and even less to do with SEO. What is Toobar PR or Toolbar PageRank? This green bar, that can be seen in the Google Toolbar available for Internet Explorer, is an indicator of quality, that is true. But it has nothing to do with real Google PageRank Algorithms. Google’s Toolbar PageRank bar, is just that, a green bar. The number displayed updates 4 times a year, once each quarter. So, you will usually see a change in your ‘Toolbar PR’ as it is called, in April, July, October, for the prior 3 month’s calendar quarters. And for some reason, usually a month early for the fourth quarter, in December. Google always updates toolbar PR early in December to mess with Christmas shoppers and put pressure on Google SEO spammers. Google will also in December perform a major shakeup of the ranking algorithms, and shake out top sites right at their biggest time of the year. Just because your Toolbar number in the green bar changes, that does not mean there is a true algorithmic PageRank update. Don’t fall for this BS that many use to get notice and traction on social posts and blogs. Some of the unskilled will even try to tell you that the green bar is dynamic, changing all the time. Totally untrue. And they damn well know it. They are lying about this dynamic update to toolbar PR to make themselves seem smart and get the notice of their followings. Be very wary of the person telling you that there is a PageRank update, because the green bar changed on their sites. Toolbar PR is an indicator of quality, a small, small indicator. Many times in the last 10 years, my sites and gone down a notch in Toolbar PR, meanwhile holding or rising in Google rankings. Toolbar PR should not matter to you in the least! What is True Google PageRank Then? True Google PageRank is a dynamic algorithm, that updates many times a day. It is just one of over 55 (probably more now, been away I have) different Google algorithms that form the basis for how Google determines rankings in Google search. Here is a good write up of how the real PageRank algorithm works on Wikipedia. So Is Toolbar Important In Any Way, Shape Or Form Then? Yes, it is, I just don’t want you to become the latest round of Toolbar PR converts that chase the green bar all around. Toolbar PR is a good indicator of quality, just as many other tools like Alexa rankings are. Just like checking Toolbar PR here is, on this PR checker I use at times… Mostly when I have to debunk Toolbar PR each year. Incoming links and the true PageRank algorithm, are becoming less and less weighted by not just Google but other search engines as well. In fact the major search engine in Asia, just totally removed any ranking algo based on incoming links. Fully interactive Google+ comments WordPress plugin, with Spam Control, +1 PM notifications, Circles or Public filtering, HoverCard overlays, and more… With not one line of code or Google API key access needed. Seriously, I had Google Plus commenting that shares into the commenters Google+ feed installed here in 60 seconds and I did not even have to change one setting. Until now, I was favoring Blogger since Google integrated G+ commenting there some time ago. You can also choose to only comment, not sharing into G+ if you wish as well. Over 300 social shares the first hour. Checkout Margie’s new Poemtography blog, where poetry, poems and photography become one, now also using Google+ comments for WordPress as well. Danny Sullivan, the most well know SEO guy there is, had tons of great things to say about “The Internship,” the new Google Movie, due out June 7th. For those not up on the plot, Vince Vaughn and Owen Wilson, play two out-of-work sales reps who manage to land, against all odds, internships at Google. 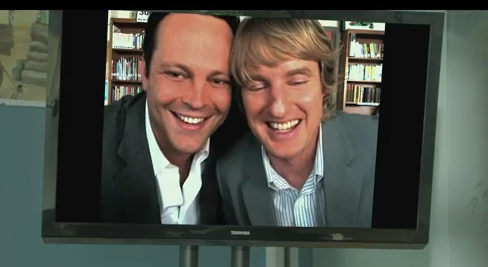 Vince Vaughn’s and Owen Wilson’s initial interview is even via Google Hangout. The Internship is like an anti-The Social Network, a film that paints Google in almost the best light possible. Google products, often with descriptions that subtly, oh so subtly, sell them. Vince Vaughn and Owen Wilson are both shown as having Google+ accounts. What Does This Mean For Google+ Marketers Like You? You can guess that I am predicting a rush of new Google Plus users in June, and continuing all summer long. Especially to use Google Hangouts. So it’s time now, to get your Google+ account in order. Get your Google profile image and cover up to date and professional. That goes for business pages too; Pay for an original, professional cover now. Be sure the content you are posting is relevant to who you want to follow you. Dump the personal stuff for the next few weeks, and focus on what potential followers in your lead funnel niche want, need. Post every day on personal profiles and business pages from now until the end of June. Your pages and profile have to be active. It only takes 5 minutes a day to share a great post on Google Plus, and no one wants to follow a page or profile that has not posted in weeks. Pay particular attention to your “About page” and craft outgoing links there that lead to landing pages, that take in leads and are focused on conversion. I am convinced, Google+ will grow faster and be more lively in June and July, than any time in the next year. Take advantage of Google+ Marketing now, or wish you had later. I am finding Authorship thumbnails to be very dynamic, and in 3 searches for the same keyword term I know well, in the same browser, I got 3 different sets of images, this morning, after reading this post. I am also finding less author thumbnails showing than what I would expect. The search was for my money term, so I am familiar with most of my competition for the term, and yes I was logged into Google. 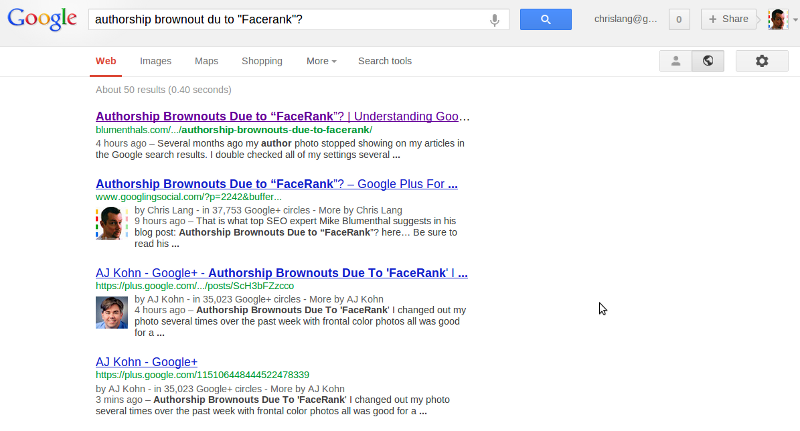 I found no author thumbs showing in social search, and only 5 in 2 pages of results, 10 results per page. 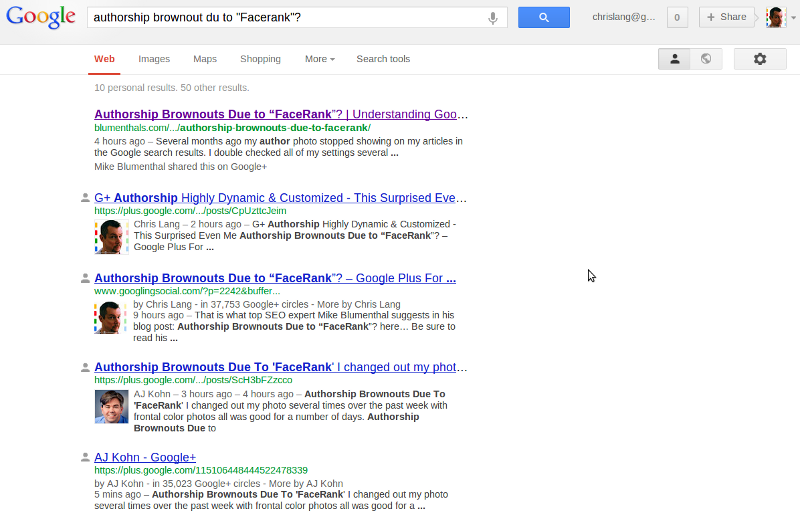 Now, in a search for my Google+ money term, don’t you think there would be tons of authorship thumbnails? Yeah, you would, so would I. Most of the author thumbs I saw displayed, had images for people with less than 100 to 200 Google+ followers, quoted in the SERP. I myself only showed in 1 out of 3 repeated searches, created by clicking the search button again and again. First, I return to my original my stance on this: That not only is Google search so highly customized that you can’t believe anything you see in a Google Search, logged in or logged out. Even on a clean machine, using your home connection and IP address, your results are heavily customized. I claim this because I have been testing it since 2009, when Google Customized Search rolled out, full time. Forget social search, and the word “Incognito” is the worst way to describe what Google calls real search results these days. Incognito has nothing to do with Google search not being customized. Incognito is in fact, Google Customized Search. Second, I believe that Google is promoting less followed people in Google Search, rather than people like myself who is highly followed. Third, Google is less likely to display people you know and people you follow in these highly customized results, including your own thumbnails. Judging your authorship success by Googling your keyword terms can mislead you. We have been seeing my own thumbs often not show when logged in as me, Chris Lang. But minutes later, from other machines on other Google logins, in my own home, the same search does show my authorship thumbnails. This has been true for over a year now. 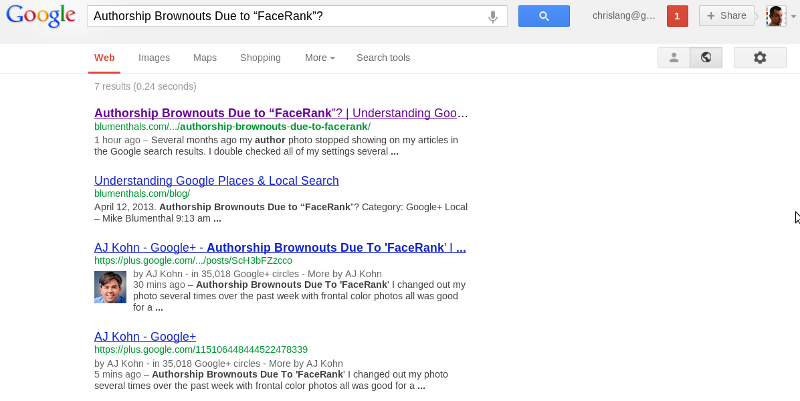 One last thought: When I searched ‘Authorship Brownouts Due to “FaceRank”?’ …. Copying and pasting Mike Blumenthal’s headline for exact accuracy, AJ Kohn was the only person who showed in the 10 results returned. And it was his G+ post that did so as in the screenshot below. Notice Blumenthal’s own blogs above it do not show author thumbs? Now that is NOT the most interesting that has happened so far…. Two hours later, in Social Search, (SPYW – search plus one your world) this blog post showed up. Then in Organic search, (since I refuse to use the misnomer “Incognito”) this blog post outranked AJ Kohn, with my thumbnail showing. Here is the same search logged out, but let me remind you, this is still a customized search for me, since I am still in the same browser, on the same IP address, in Denver, CO. I did check this result from a Internet Cafe PC, and it is accurate and non customized to me as it is above. So what is really going on with Authorship here? Only Google knows, and we keep guessing! UPDATE: Be sure to note, in Blumenthal’s post, he did say, he just changed to color for B&W yesterday. It usually takes 3 days for G+ thumbs to update. But my main interest in this test is to see who ranks where from different links on a highly, highly niche term. Expect Mike to show in this search on Monday in color. I have seen so many saying they are reorganizing their Circles for 2013, or saying they are removing many from their Circles. I suggest your ask yourself these 10 Google Plus questions about why someone would Circle YOU first! #10 Is what I share valuable? #9 Is what I share valuable to people who click thru to my sites? #8 If it is valuable, is it worth Circling me to get more? #7 If it is worth Circling me for, is it valuable enough to get me added to a top level Circle? #6 If I am added to a top level Circle is this the kind of valuable material I share all the time, or will I be removed later since since I share whatever suits me that day? #5 Just because I get big shares on off Business oriented posts, like Caturday pics, does this endear my following? #4 Did people Circle me for what I share or just because some big G+er shared a Circle? #3 Do I observe the 80 / 20 rule? 80% Great Content – 20% My Own Content at the most? #2 Do I have the fortitude to say no when someone asks me to share something that does not get a yes above? #1 I if were to add me to a Circle today, by juding what is on my personal profile right now, what Circle would I add me to? You may have heard that G+ pages can now +1 and comment on any post, be it a page or a personal profile post. But what I really want to do is Share great content from G+ers to my page. Right? In this short video today I show you all the breaking news AND how you can now share any content into your Google+ page. Also Google is finally talking Google Analytics for G+ pages. It’s all here in this 8 minute video. UPDATE: Watching at 4:32 plus ones are still rejected. The warning appears at the top of the page (in red) but is easy to miss. Thanks to Robert Wallis for pointing this out. What matters to me is commenting and above all sharing great content to my pages. And remember, Google Places pages with G+ integrated can now do the same, so you can comment all over the place as your Google+ Places, G+ biz page. Have fun with this a share some great content to your G+ pages.